Uponor ETIof an outer corrugated wall fused to a smooth interior wall, the Ultra-Corr PVC corrugated sewer pipe is designed for strength and flow efficiency. This large diameter profile wall pipe utilizes a seamless design with radial corrugations for ease in handling and field fabrication. Available from 24-36-in., the pipe is designed to resist earth and impact loads normally associated with sewer and drainpipe installations. This unit features a bell and spigot joint, chemical and corrosion resistance, and a rubber gasket pre-tensioned around the spigot to provide a tight joint in compliance with ASTM D3212. 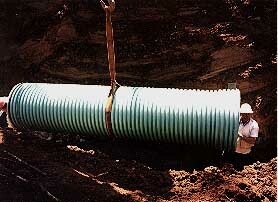 The pipe is a flexible conduit and has a minimum pipe stiffness of 50 psi. It is abrasion, gouging and scarring resistant, and is designed to not rot or corrode.